ThinkGeek has taken an April Fool’s joke from last year and made a product out of it, the iCade. 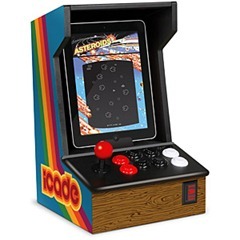 $99 gets you an enclosure for your iPad that turns it into something resembling a classic arcade machine, complete with retro joystick and buttons. The iCade works with Atari’s Greatest Hits to seal the deal and deliver that true retro gaming effect. Living in the future sure looks and feels a lot like living in the past sometimes.